Local studies information is held at Rochdale Local Studies Library. The monumental incriptions for Hope Street Baptist, Milnrow St James, Ogden Baptist and West St Baptist have been published by the LFH&HS. Dave Ollerton has been recording Gravestones at Rochdale Cemetery. Details about the census records, and indexes for Rochdale. You can also perform a more selective search for churches in the Rochdale area or see them printed on a map. Here are extracts from 'Rochdale Past and Present, a History and Guide' by William Robertson, 2nd edition, Rochdale: Schofield and Hoblyn, 1876. All of the material following is direct quotation except for the words in [square brackets] and has been provided by Charlie Watson nolacharlie[at]ids.net[dot] The square bracket material found at the end of most entries indicates where further information can be found in the book. This church was built in the year 1835, out of a fund provided by parliament for the erection of churches in the manufacturing districts, which was commonly known, on account of its amount, as the million grant. The site was given by James Royds, Esq., of Mount Falinge, who also afterwards gave ground for a school and a parsonage house. ... [informaiton on the endowment] In the year 1870 a new National School was erected in connection with the church, and the old building was converted into an Infant School. St. Peter's Church, Newbold, situated in a thinly populated but growing district, off Milnrow-road, was consecrated for divine worship in May, 1871. ... [much description of the interior] As a result of [the vicar's] indefatigable efforts in a church district that was brought into existence as such by the passing of the Rochdale Vicarage Act, and containing a population of about 6,000, almost entirely consisting of factory operatives, he has been able to gather together a numerous congregation, who meet for worship in an elegant building, and whose children may receive a good education in some really excellent schools, which are spacious, lofty, and well ventilated. The tower and spire of Christ Church, Healey, are visible for miles round, as the church stands on a slight elevation, and is a prominent feature in the landscape. Previously to the building of this church, in the year 1850, the Rev. Mr. Stanier conducted worship in a warehouse at Broadley, and by his labours brought together a good congregation. It is now upwards of a hundred years since the Baptist church originated in Rochdale. Prior to the year 1773 there were a few godly folk, members of the Baptist churches at Bacup and Wainsgate, who resided in Rochdale, and who, Sunday after Sunday, used to cross the hills, to their own place of worship, to attend the ministry of Mr. Hirst or Dr. Fawcett; after a while, however, they succeeded in obtaining the services of these and other ministers in their own houses, and as the result of their preaching, nine persons were baptized, in the river Roach, on the 12th October, 1773, in the presence of a great crowd of people: This baptism took place nearly opposite where the New Town Hall stands. The first congregational minister who made Rochdale his home, was the Rev. John Ely. He commenced his labours in Providence Chapel a few months after its purchase in 1814. ... After [they removed their debt] , prosperity was uninterrupted, until the removal of the pastor to Leeds. Amongst the external evidences of this prosperity may be mentioned the several circumstances of the establishment of branches at Smallbridge and Calderbrook, 1824, and the erection of an organ in the chapel, 1822. [In 1852 occurred] the separation of a large part of the congregation, who afterwards erected Milton Congregational Church. [About 1866 a dispute arose with the result of] the secession of a number of the congregation, who afterwards became the United Presbyterians. Previously to the year 1808 the members of this society, from Oldham and Rochdale, were in the habit of assembling at Turf Lane End Meeting House, which is four miles from Rochdale and two from Oldham, but they ultimately erected a place of worship in each town. ... It is here the Right Hon. John Bright regularly attends for worship when at home; but we believe he does not ever address his fellow-worshippers on such occasions. In the year 1835-6 a large secession from this congregation and society took place, and eventually formed the congregation now assembling in the Methodist Free Church, Baillie-street. Baillie-street Chapel, belonging to the United Methodist Free Churches, was opened for Divine worship on January the 8th, 1837. ... It is the largest place of religious worship in the town, having accommodation for 1,800 hearers. ... In the year 1864 Mr. Oliver Ormerod laid the foundation stone of Castlemere Chapel, a fine spacious edifice, off Drake-street, which has 1,250 sittings, and it cost about £8,500. It was opened for Divine worship on September 6th, 1865. This is not only the oldest dissenting chapel in Rochdale, but the oldest place of worship of any kind, except St. Chad's Parish Church. ... It was not till the year 1689, when William the Third passed the "Toleration Act," that the Rochdale Presbyterian dissenters dared to meet together in a meeting-house of their own, without fear of molestation from the authorities. The first meeting-house or chapel seems to have been in existence from the year 1690 till 1716, when a new one was erected and duly licensed as "a meeting-house of dissenting Protestants," at the Quarter Sessions, held at Manchester, October 17th, 1717. ... The old chapel existed from 1717 till 1856, when it was pulled down, and the present neat, though rather small chapel was erected. The following have been published by the LFH&HS. Marriage indexes for St Chad and Wardleworth chapelry 1813-1837. Baptism register index Providence Congregational Chapel 1850-1958. Baptism register index, Parish church Nov 1894 - Dec 1899 . Index of the Friends Burial Ground interments. The Register Office covering the Rochdale area is Rochdale. A substantial proportion of the old parish of Rochdale was in Yorkshire. Details of a number of places in this parish have been extracted from Langdale's Topographical Dictionary of Yorkshire(1822). Ask for a calculation of the distance from Rochdale to another place. "CHADWICK, a hamlet in the parish of Rochdale, hundred of Salford, in the county of Lancaster, 2 miles W. of Rochdale, where stands Chadwick Hall." "CLAYLANE, a hamlet in the parish of Rochdale, hundred of Salford, in the county of Lancaster." "FAILINGE, a hamlet in the parish of Rochdale, hundred of Salford, county palatine Lancaster, 1 mile W. of Rochdale." "HUNDERSFIELD, a chapelry in the parish of Rochdale, county Lancaster, 4 miles N.E. of Rochdale. The living is a perpetual curacy in the diocese of Manchester, value £300, in the patronage of the vicar." "ROCHDALE, a parish, market town, and parliamentary borough in the hundred of Salford, southern division of county Lancaster, but containing many places in the West Riding of Yorkshire; 11 miles N. of Manchester, and 218 by rail from London. The town is situated on the river Roach or Roche, a tributary of the Irwell, whence it derives its name. Its population in 1801 was 8,542; in 1851 it was 29,195; and in 1861 it had increased to 38,184, occupying 7,705 houses. The population of the parish, which extends into the West Riding of Yorkshire, and covers an area of 58,620 acres, was 119,531 in 1861. The town occupies the site of a castle built by the Saxons at Castleton, and probably destroyed in conflicts between the Saxons and the Danes in the 11th century. Many of the streets are narrow and irregular, but great improvements have been lately made, several of the more important thoroughfares having been widened and rebuilt. The houses are generally built of brick, and in the older quarters the roofs are for the most part of stone, instead of slate. The streets are paved and lighted with gas, and there is an abundant supply of excellent water from four reservoirs in the neighbourhood. The river is crossed by five bridges, one of which, of light ironwork, is used by foot passengers only. The principal public buildings are the townhall, used also as a newsroom, a public hall for concerts, grammar, British, National, and other schools. The parish church, raised in honour of St. Chad, is situated on an elevated site, and is approached from the lower parts of the town by a flight of 122 steps. It was built in the 12th century, partly in the Norman and partly in the perpendicular style. It underwent considerable repairs in 1856, has a square embattled tower, besides several windows of tracery, and some ancient monuments. The living is a vicarage in the diocese of Manchester, value about £2,000, in the patronage of the bishop. Besides the parish church, there are St. Alban's, of recent erection, St. Mary's, and St. James's, and in the rural parts of the parish 17 other churches, the livings of which are all perpetual curacies, varying in value from £67 to £300. In 1835 the parish of Rochdale contained the townships of Rochdale, Todmorden with Walsden, Spotland, Blatchinworth and Calderbrook, Wuerdle and Wardle, Wardleworth, Castleton, Butterworth and the township of Saddleworth in Yorkshire. 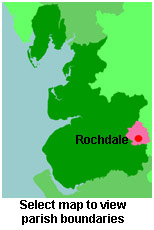 You can see the administrative areas in which Rochdale has been placed at times in the past. Select one to see a link to a map of that particular area. A description of Rochdale in the 19th century. View maps of Rochdale and places within its boundaries. The Workhouse site has an interesting description of Rochdale workhouse. For probate purposes prior to 1858, Rochdale was in the Archdeaconry of Chester, in the Diocese of Chester. The original Lancashire wills for the Archdeaconry of Chester are held at the Lancashire Record Office.